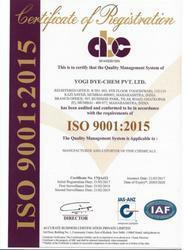 As an ISO 9001:2008-certified organization, we have a team of skilled quality auditors who assist us in offering a variety of pharmaceutical raw chemicals, veterinary feed additives, bulk drugs and chemicals. Our quality analysts strictly monitor the entire production process, starting from the raw material procurement to the final delivery of the products. We ascertain that each and every product being dispatch undergoes rigorous tests to ensure high performance and quality standards. As a client-centric organization, we are focused towards achieving complete client satisfaction. Owing to our team of professionals, we are able to formulate quality range of products and gain the credibility of being a leading manufacturer and exporter in this field. Our strong infrastructural facility along with the hard work of our team has enabled us to garner the faith of our clients spread all across the world.